Last night's Annual Dinner served as the official launch for LEADING THE WAY, a $75 million campaign to transform GA's campus, promote programmatic innovation, and invest in our community of students and faculty. Campaign Co-Chairs Andra Winokur Newman '95 P'28 P'32 and Bart Osman P'15 '18 '22 announced that $30 million has already been committed to the campaign by early donors and introduced a video highlighting the visionary goals of Leading the Way. The first major campaign building project, the construction of a new Pre-Connecting Class school building is underway, with plans in development for: a new Lower School with a state of the art auditorium; an addition to the Middle School; an expanded Engineering and Design Lab; a new Visual Arts Center that will free up space in the Upper School for expanded STEM facilities; a café and teaching kitchen; and courtyards and increased gathering spaces to bring the community together. Equally important are Leading the Way's objectives to strengthen investments in people and programs. 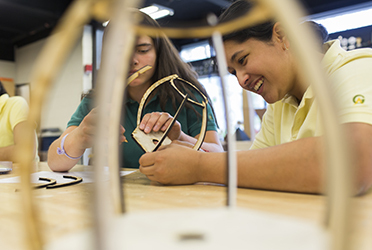 From STEM to the humanities, and from athletics to the arts, GA's faculty is its key differentiator. This campaign will provide the endowment to ensure GA will continue to attract and retain world-class faculty, and that they are supported in their efforts to introduce and enhance innovative programs and partnerships. Maintaining a GA student community that is healthy, inclusive, and diverse is also a top priority for the school. Investments in financial aid, health and wellness programs, and curricular offerings that expand a student's global perspective have an immeasurable benefit on the girls and the community as a whole. For 192 years, Greenwich Academy has been leading the way. 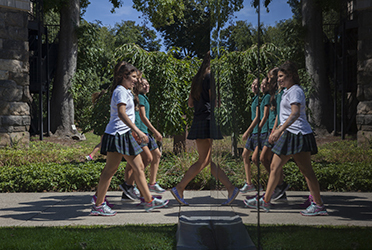 And there is no doubt that this campaign—the largest in the school's history—will position GA to remain at the forefront of the education of girls and young women.